A strong yet beautiful Saab was sadly destroyed early this morning in Philadelphia when a large, oafish, beastly scoundrel of a garbage truck, big and heavy and destructive, unlike an honest and proud Saab, suffered a “mechanical issue” (makes sense for a vehicle that’s not a Saab) and crashed into a number of cars on a South Philly street, including, cruelly, this Saab 9-3 convertible. 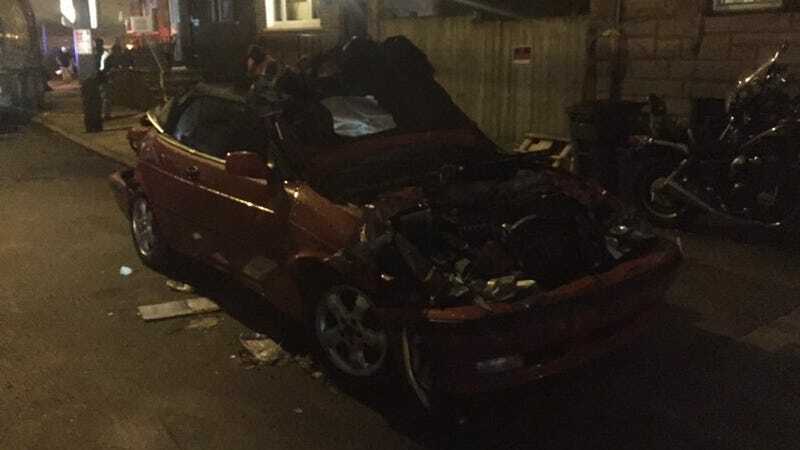 The Saab 9-3 convertible wasn’t the only victim. There was also what appears to be a Mercury Milan that was badly damaged, in addition to a Subaru Outback that somehow ended up on top that dear, sweet, innocent Saab. As you can see, a VW Vanagon appears to have survived unscathed. All told, around 10 cars were hit by the private dump truck, whose driver was not charged in the incident. That poor Saab. Just minding its business and trying to get a good night’s sleep, rudely awakened with destruction. *Lead and headline courtesy of Raphael Orlove.